Creamy Garlic Butter Tuscan Shrimp coated in a light and creamy garlic parmesan sauce filled with sun dried tomatoes and spinach! Guaranteed to impress! LOW CARB AND KETO APPROVED! 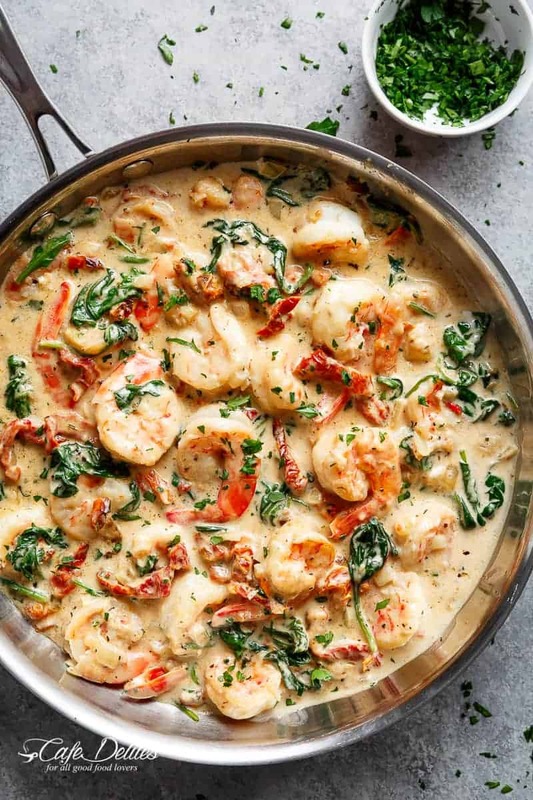 Leave people wondering if there is a hidden chef in your kitchen with this Creamy Garlic Butter Tuscan Shrimp. Quick and easy to make, ready on the table in less than 15 minutes, you will even impress yourself! Tuscan? I know, I know. This is NOT a traditional recipe form Tuscany… BUT it is a ‘traditional’ recipe — in chicken form — from the popular Olive Garden Italian Restaurant. However, me being me, I added my own twist with garlic butter since we’re dealing with shrimp here, and made it so much better than the original. Garlic. Butter. You are going to fry your shrimp (or prawns) in butter FULL of garlic. I could have left this recipe right here….but then I wouldn’t be doing anything different to this Lemon Garlic Butter Shrimp. And that’s NO BUENO. 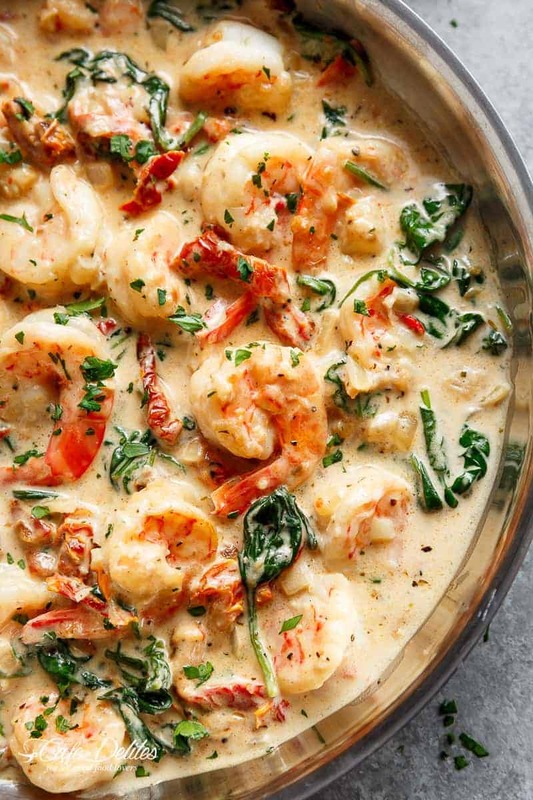 SO… Garlic Butter Shrimp SMOTHERED in a beautiful and creamy Tuscan sauce. WHAT CAN YOU SERVE WITH TUSCAN SHRIMP? Over pasta that has been mixed through with olive, salt and garlic. Also, a touch of parmesan never hurt anyone. Garlic bread: soaking up creamy sauce with a warm piece of bread. It’s heaven. Rice. Yes, this is amazing with rice also. Or keep it light and serve it for lunch or as a delicious appetizer with French bread slices, or on its own! WHAT WINE GOES WELL WITH THIS? I choose a white wine to go with this. A light Chardonnay or Pinot Gris pairs really well. For a sweeter wine, choose a Riesling or a Sparkling Moscato. An easy to make and filling meal. You can use shrimp with tails on or off. Try to find fresh wild caught shrimp. Frozen shrimp is good too, but fresh will always have a better flavour. If you don’t want to use salted butter, use unsalted and season shrimp to suit your taste. Half and half is an American product, made from equal parts light cream and milk. Feel free to use half light cream and half 2% milk (or full fat if not worried about calories and fat counts), in place of half and half. Alternatively, use all light cream or heavy cream if you wish. I use sun dried tomatoes in oil, and drain them reserving about 1 teaspoon for added flavour when cooking. If you LOVE this Creamy Garlic Butter Tuscan Shrimp recipe, try this CREAMY TUSCAN SALMON VERSION OR this TUSCAN CHICKEN MAC AND CHEESE! 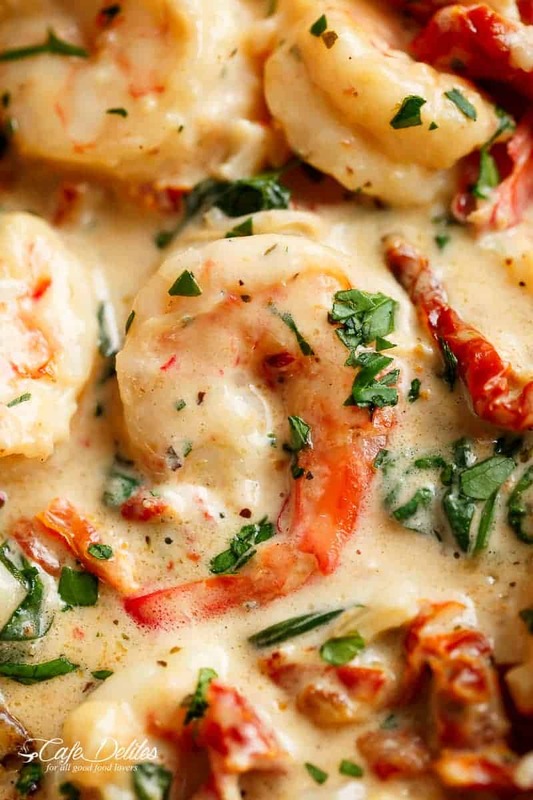 Creamy Garlic Butter Tuscan Shrimp ON VIDEO! ORIGINALLY PUBLISHED FEBRUARY 14, 2017. Creamy Garlic Butter Tuscan Shrimp coated in a light and creamy sauce filled with garlic, sun dried tomatoes and spinach! Packed with incredible flavours! Fry the onion in the butter remaining in the skillet. Pour in the white wine (if using), and allow to reduce to half, while scraping any bits off of the bottom of the pan. Add the sun dried tomatoes and fry for 1-2 minutes to release their flavours. Half and half is an American product, made from equal parts light cream and milk. Feel free to use half light cream and half 2% milk (or full fat if not worried about calories and fat counts), in place of half and half. Alternatively, use all light cream or heavy cream. Substitute half and half with almond milk. If serving with pasta: add in pasta cooked al dente along with 1/4 cup of reserved pasta water into the pan of shrimp once they are cooked. Gently mix through the sauce until combined. Serve immediately. © 2017 CAFE DELITES. All rights reserved. All images & content are copyright protected. Please do not use my images without prior permission. If you want to share this recipe, please provide a link back to this post for the original recipe. More Tuscan Inspired Recipes For You!